The battle over school starting and ending dates continues this week in Annapolis as the state Senate is set to vote on a bill allowing local school boards to set their own dates and House of Delegates committees are to hold hearings on similar bills. Also on the agenda in the Maryland General Assembly are bills to reinstate Maryland’s death penalty, squash Governor Larry Hogan’s plan for a new Redskins stadium in Prince George’s County and prohibit local school boards from spending money to arm teachers and more. Here is a partial list of committee hearings and other items of interest in Annapolis for Feb. 11-15. Budget and Taxation subcommittees have scheduled have scheduled hearings on funding for several state departments and agencies, including the Department of Labor, Licensing and Regulation, the Maryland Health Regulatory Commission, the Department of Veterans Affairs, the state parole Commission and the Division of Parole and Probation. An Appropriations Committee subcommittee has scheduled hearings on funding for the state Department of Transportation, the Department of Planning and the Lottery and Gaming Control Agency. Finance Committee has scheduled hearings on several bills, including one to expand the vehicle excise tax credit for plug-in electric vehicles to include some fuel cell electric vehicles and bills to prohibit car insurance companies from denying coverage or increasing rates based on a person’s occupation, education or credit rating. Education, Health and Environmental Affairs Committee has scheduled hearings on several bills, including one to authorize the governor to include Maryland in agreements to limit greenhouse gas emissions and to impose greenhouse gas emissions fees on motor fuel, and a bill to ban polystyrene food containers. 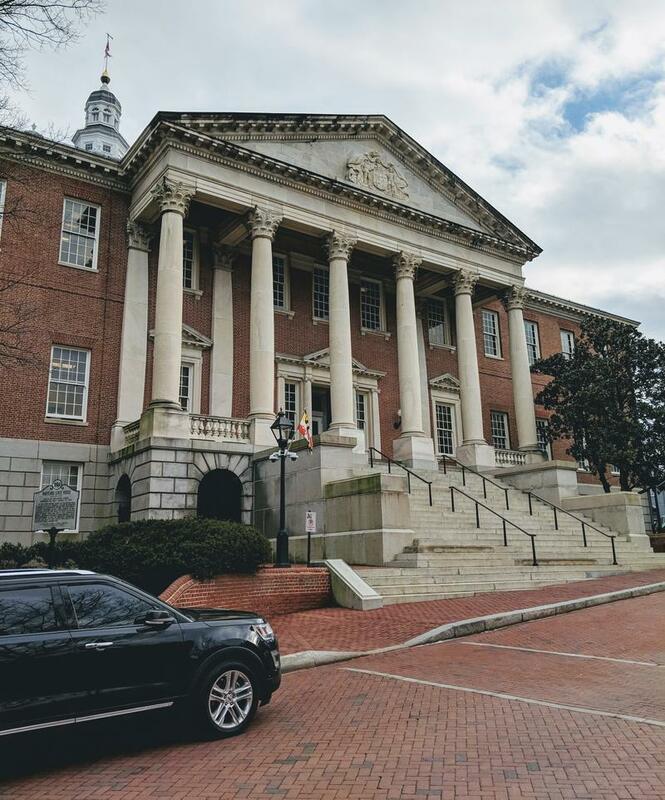 Judicial Proceedings Committee has scheduled hearings on several bills, including one to reinstate Maryland’s death penalty and one to require the state to pay compensation to anyone jailed for a crime he didn’t commit. Appropriations Committee has scheduled hearings on several bills, including one to prohibit local school boards from spending money to provide a teacher with a gun and one to squash Governor Hogan’s plan to exchange state land in Western Maryland for federal land in Prince Georges County to build a new stadium for the Washington Redskins. Ways and Means Committee has scheduled hearings on a number of bills, including one to allow voter registration on election day, another to allow high school faculty and staff to register to vote at schools and one to prohibit local governments from imposing admissions or amusement taxes on agri-tourism businesses. Judiciary Committee has scheduled hearings on several bills, among them one to classify human trafficking as a crime of violence and one to establish a Maryland Lynching Truth and Reconciliation Commission. Finance Committee Has scheduled hearings on a number of bills including one aimed at providing access to healthy foods for people living in food deserts. Education, Health and Environmental Affairs Committee has scheduled hearings on a number of education related bills, including one that would require middle and high schools in Maryland to include units of instruction on the Holocaust and genocide, another encouraging local school boards to implement agricultural education programs and one to prohibit local school boards from spending money to provide a teacher with a gun. Appropriations Committee subcommittees have scheduled hearings on funding for several state departments and agencies, including the Maryland Public Broadcasting Commission, the Department of Aging, the Department of Social Services and the Maryland African American Museum Corporation. Ways and Means Committee has scheduled hearings on a number of tax related bills, including one to reduce the state’s corporate income tax rate from 8.25 percent to 6.25 percent and one to expand the number of farms that can get tax credits for contributions to food banks. Environment and Transportation Committee has scheduled hearings on a several bills, including one to expand the vehicle excise tax credit to include fuel cell electric vehicles. Judiciary Committee has scheduled hearings on several bills, including one to send repeat offenders convicted of drunken or drugged driving offense to jail. Finance Committee has scheduled hearings on several bills, including one that adds a requirement that applicants to be correctional officers pass an extensive background check as well as a polygraph examination. Education, Health and Environmental Affairs Committee has scheduled hearings on several bills, including one to increase the number of early voting centers a county is required to have and that they open at 8 a.m. Judicial Proceedings Committee has scheduled hearings on a number of bills, including one to require diaper changing facilities in public restrooms in certain public buildings and places of public accommodation. Economic Matters Committee has scheduled hearings on energy related bills, including two that would include nuclear energy and hydroelectric power in the top tier of renewable energy sources. Ways and Means Committee has scheduled hearings on several bills including two aimed at upsetting Governor Hogan’s order setting school start and end dates. One would authorize local school boards to extend the school year past June 15 by five days without approval from the state school board,, and another that would require local school boards to set start and end dates for the school year. Budget and Taxation Committee subcommittees have scheduled hearings on funding for several state departments and agencies, including Morgan state University, the Maryland Higher Education Commission, the Department of Housing and Community Development and the state Public Health Administration. The Judiciary and Health and Government Operations Committees have scheduled a joint hearing on a right to die bill named for former Annapolis Mayor Roger w. “Pip” Moyer and former Annapolis Alderman Richard Israel, both of whom died from Parkinson’s disease. For more detailed information on bills and hearings, visit the General Assembly of Maryland's website. A state House committee is considering a bill gradually raising Maryland’s minimum wage to $15 an hour in the next five years. Local leaders, business owners and labor union representatives came to express their support for the bill.